We are used to hearing the keyboard music of the great harpsichord masters Bach, Scarlatti, even Handel, played on the piano, but why not that of their contemporary, François Couperin ‘le Grand’? 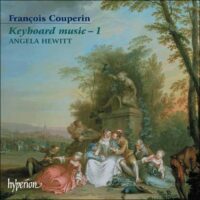 Putting this question to Angela Hewitt initiated appropriate investigation, with the result that she has now taken the jewelled miniatures of the French maîtreinto her repertoire in addition to her celebrated Bach. This is the first of three CDs devoted to the composer and is devoted to Ordres 6, 8 and 18 which include several of his most well-known pieces: Sœur Monique, Le Tic-Toc-Choc, Les Baricades Misterieuses and the famous Passacaille.